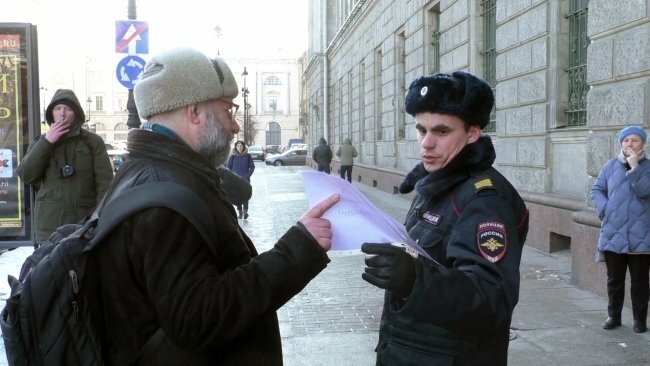 “Have you heard they want to merge the Russian National Library with the Lenin Library in Moscow?” Boris Kolonitsky, a senior researcher at the St. Petersburg Institute of History (Russian Academy of Sciences) asked passerby. Most bystanders heard about these developments for the first time. But after a short briefing, passersby agreed it would be wrong to merge one of the country’s most important academic and cultural institutions. “It matters that people from the outside, people who don’t work at the library but understand its value, speak out,” said journalist Daniil Kotsiubinsky, who organized the rally. As the rally was drawing to a close, the overall enthusiasm was disturbed by a police officer. “We’ve got a solo picket here,” the guardian of order reported on his cell phone, asking the picketers to show him their papers. The idea of merging Russia’s two biggest libraries was proposed to culture minister Vladimir Medinsky by their directors, Vladimir Gnezdilov (the Russian State Library in Moscow, aka the Leninka) and Alexander Visly (the Russian National Library in Petersburg, aka the Publichka). The proposal has hardly garnered universal approval. The country’s leading authorities on librarianship have sent a letter to President Putin asking him to stop the merger from going ahead. They have been supported by Russian philologists and historians. Tatyana Shumilova, chief bibliographer in the Russian National Library’s information and bibliography department, spoke to Rosbalt about how staff there have related to the possible merger with the Russian State Library, and whether the issue has been broached with them. What are the possible consequences of merging the country’s two biggest libraries? Our library would simply cease to exist in its current shape. Many people have made much of the fact that the RNL’s executive director Alexander Visly has said the changes would not give rise to a new legal entity. Of course, they wouldn’t. One legal entity would remain: the RSL. So everyone realizes it’s not a merger that is at issue, but a takeover. So we could equate the words “merger” and “destruction” in this case? Yes, definitely. A merger would be tantamount to the death of our library here in Petersburg. After the RNL became a branch or appendage of the RSL, our work with readers would cease to be funded. We would not be able to provide them with the full scope of services. Plus, we would have to switch to the RSL’s system, and that would be undesirable. We are told the catalogues in both libraries are structured on the same principle. That is not true. There is a big difference between them. It would be quite complicated to restructure the system. The different approaches to librarianship should be preserved. Moscow has the administrative resources. The government is located in the capital, as is the Culture Ministry. Moscow and Moscow Region are the home of the RSL, the Russian Institute for Scientific and Technical Information (VINITI), the Russian National Public Library for Science and Technology, the State Historic Public Library of Russia, and the Russian State Library for Foreign Literature (aka the Inostranka). And, until recently, the Institute of Scientific Information on Social Sciences of the Russian Academy of Sciences (INION RAN) was running at full steam. But the Northwest Federal Region has only two major libraries, the RNL and the Library of the Russian Academy of Sciences (aka the BAN). After a merger, there would be one. I understand that, after the merger, publishers would not have to send an obligatory copy of their books to the RNL. Only Moscow would get new books? That is one of the cost-saving measures. Allegedly, money would not have to be spent on two sets of obligatory copies. It would be enough to have one hard copy and a digital copy. But the outcome would be that Petersburg would simply stop receiving most new books. It’s a rather cynical cost-cutting measure that would affect only our library, not the RSL, which was founded much later than the RNL. And all because it’s located in Moscow. No one says it outright, but it’s clear anyway. But the RNL would still get a digital copy. I really don’t understand the idea of sending a digital copy instead of a hard copy. We have a huge number of readers who for medical reasons cannot and should not use a computer. Why should we deprive them of hard copies? It’s simply indecent. Besides, we know what natural disasters electronic resources are prone to. A blackout, a power surge in the network, a server failure, and everything is lost. A library should not be dependent only on one type of resource. People who take far-reaching, momentous decisions like to base them by alluding to the know-how of other libraries and even other countries. But nowhere do national libraries receive only digital copies of printed matter. You can probably merge libraries in Denmark, but the Russian Federation is a different country, a much larger country with a much larger population. Although the name would stay the same, the RNL would in fact cease being a national library. We already have municipal and neighborhood libraries in Petersburg. People come to us as a last resort, when there is nowhere else to go. Nor is anyone probably really aware that digital copies relate not only to books but to magazines and newspapers as well. Apparently, the shots are being called by people who don’t read and don’t go to libraries. Just how did the culture minister write his dissertations and books? By using the Internet? Or did someone else do it for him? Where did the idea to merge the libraries come from? Rumors about the merger have been circulating for a long time. They are all we have to go on, for no one has said anything officially. It’s still too early to draw any conclusions from the available facts. Now no one denies that merger talks are underway. Earlier, apparently, they were too busy to reveal this, or maybe they were ashamed or embarrassed. But now they’re not ashamed anymore. After the Soviet Union collapsed, Vladimir Zaitsev, the then-director of the Publichka, was worried about the library’s potential plight. That was when the name Russian National Library was coined. Lots of people didn’t like it, but Zaitsev thought it would give us stability and protect us from attacks. As we see now, it didn’t work for long. The opportunity to save millions of rubles has now been identified as grounds for merging the libraries. Indeed, you could probably calculate the worth of the books and the real estate by eye. But how do you evaluate the intangible assets? How many people have been educated here? How many people, from university students to scholars, have grown up here? They wrote their dissertations and books here. If you write a research paper based on more than two sources, you are going to need a library. This is serious work. It is believed the RNL’s current director Alexander Visly was sent to Petersburg on a “temporary assignment” in order to merge the two libraries. Do you agree? Officials rarely condescend to explaining the reasons for their actions directly. They believe they should not be accountable to the taxpaypers. No one has announced anything to us officially. But talk of a possible merger started after Anton Likhomanov left the director’s post at the RNL in early 2016. Visly wasn’t the only person tipped for the vacancy, after all. The director of the Lermontov Interdistrict Centralized Library System, in Petersburg, and the director of the National Library of the Republic of Karelia were identified as possible candidates. Several months passed between Likhomanov’s departure and Visly’s arrival. We don’t know what was discussed during that time. Apparently, there was some kind of horse trading underway. According to the rumors in Moscow, Visly really didn’t want to move to Petersburg, but he was nevertheless talked into going in order to perform certain functions. The fact that an executive director has not yet been appointed at the RSL, and they only have an acting director, causes one to reflect grimly on the subject. Indeed, Visly has not taken an interest in day-to-day affairs in Petersburg. He is busy with construction, renovating the Lenin Reading Room, and he has visited the cataloguing and acquisition departments. By the way, officials have been saying the functions of these departments overlap at the RNL and RSL. So he hasn’t been dealing with the library as a whole, although he is the executive director and should be responsible for everything that happens in the RNL. Apparently, this circumstance has been agreed upon with someone. No one would reproach him for it. Has the issue of the possible merger been discussed with RNL staff? There have been no meetings on the topic with the workforce, and none are planned. No one keeps us in the loop. There are no general staff meetings. There is the practice of informational meetings, to which the heads of the departments and units are invited. My comrades once expressed a desire to take part in one such meeting, but they were simply booted out. Staff members only talk about the merger amongst themselves. Very little that is positive. Everyone fears for his or her future. But what can rank-and-file library staffers do? Some signed the letter supporting the library, while others didn’t. Some have signed a petition. What else can we do? We need large-scale outside support, but how do we get it? People know very little about the merger of the libraries, after all. Even if they wanted to find out about the consequences of the mergers, where would they look? Yandex News. And what would they find there? News about fires, missing schoolchildren, pedestrians run over by cars, and people falling from tall buildings. There is almost no news about culture. And how do we explain to university lecturers, university students, and schoolchildren what could happen to the library? How do we convince them that the problem concerns them, too? Even university students come to us for textbooks, because the university libraries are shortchanged when it comes to new acquisitions of books. But our customers, people to whom provide information, include the St. Petersburg Legislative Assembly, the Investigative Committee, the FSB, the Interior Ministry, and other organizations. So it turns out they could not care less, either. Or they naively believe nothing will change. Maybe they don’t understand the consequences? Have you thought about organizing a protest rally? Few library staffers would attend such a rally. Everyone is scared redundancies will kick off, and his or her department will be eliminated. There is the chance of winding up on the streets. There are people working here who went through the hungry 1990s on miserly wages. At least they were paid regularly. Director Vladimir Zaitsev, who constantly traveled to Moscow and literally sat in the minister’s waiting room, deserves the credit for that. So a lot of people would not attend a rally. No one wants to lose their job. Take a look, for example, at how many people came out to defend St. Isaac’s Cathedral. A lot fewer than could have come out. People today are surrounded by informational noise. They hear about Crimea, Ukraine, and America. Old ladies at bus stops don’t discuss cultural issues, but US Presidents Obama and Trump. Everyone in Russia is totally confused. What consequences would the merger have for readers? For example, one of the plusses that has been mentioned is that people with RNL cards would be able to use the RSL in Moscow. Initially, readers would have no sense of any change. They just wouldn’t understand anything. After all, we would continue to acquire some new books. Qualitative negative changes build up unnoticed. They’re not visible immediately. In Germany in 1933, not everyone realized immediately what exactly was happening, either. As for a single library card for the two libraries, there wouldn’t be much advantage to it. RNL readers can easily get a card for the Leninka, and Leninka readers can easily get a card for the RNL. It’s a snap: you just need your internal passport. You don’t even have to bring a photograph to the registration desk anymore. So is there any way out of the situation, or is the RNL’s takoever inevitable? I don’t want to accept the fact it could happen. But RNL staff are hardly in a position to do anything. They have almost no influence on the situation. Respected people, prominent scholars and cultural figures, have to speak out, people with whom the authorities have to reckon. As it is, only Arkady Sokolov and Valery Leonov, out of the entire Petersburg library community, have spoken out on the topic. None of the museums or universities have openly supported us. It is sad. I don’t think the city could solve the problem by talking the library under its wing. That would only delay its death. The city could not fund the RNL properly. I don’t know what other options we have for saving the library. We have let the moment passs when we could have looked for sponsors to support us financially. What do RSL employees think of the merger? They are silent because the merger wouldn’t affect them. They would continue to function as before and do the same things they did earlier, such as acquiring the obligatory copies, hard copies and digital copies, of everything published in Russia. The negative consequences would only affect us, meaning the Russian National Library. The most concise definition of culture is this: culture is the transmission of tradition. Breakdowns in the production, concentration, and reclamation of the national heritage (a process in which libraries are an inalienable and quite important component) have led to the collapse of civilizations throughout history. Then people go looking for the extraterrestrials who flew in and destroyed everything. The perpetrators are actually much closer.